This really is a great family room, with an informal eating area, a media center, toy storage, and study desks. Cathedral ceilings give a spacious feeling to this modest-sized room, while attention to detail creates an intimate place for family gathering. By adding windows all around, the house is flooded with daylight and has a strong connection with nature. 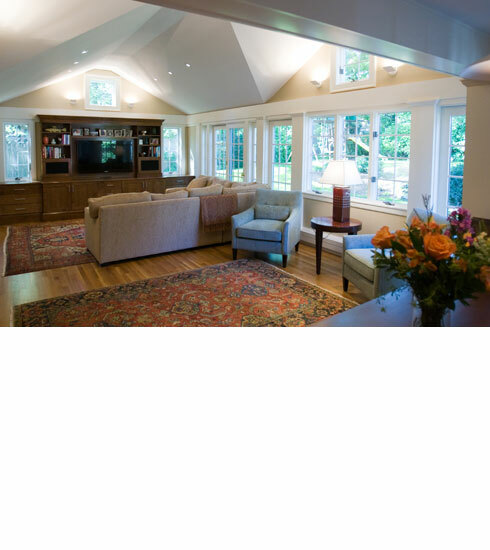 By retaining the original gable roof and windows we were able to control costs while creating a jewel of an addition. Just as daylight brings the natural landscape into focus from within, at night the yard most strongly feels the presence of the house. Landscape improvements include an outdoor bluestone patio and terraced gardens beyond. It is gratifying to us as designers to hear the homeowners report that they spend more time together as a family. With a homework center and drawers for toys, along with the media center and comfortable furniture, it’s easy to see why this great room is the new hearth of family life. A horizontal valence and extensive wood moldings bring warmth and order to a space that is architecturally very lively. Custom-built cabinets in stained cherry bring sophisticated charm to the task of storage throughout the addition.